The giant panda does not hibernate but will shelter in caves or hollow trees in very cold weather. Giant pandas have a bear like appearance. Their distinctive black and white colouring makes them one of the best-known species in the world. They can reach 6 ft (1.9 m) in height and in the wild weigh around 220–250 lb (110–115 kg), although adult males can weigh up to 350 lbs (160 kg). The reason behind the black and white coat is unknown, but it is thought that the colouring provides camouflage for giant pandas in their natural environment. Where do giant pandas live? Giant pandas live in bamboo forests in remote mountainous regions of western China. The majority can be found in Sichuan province but they also inhabit areas in the neighbouring provinces of Shaanxi and Gansu. The cool wet environment provides the perfect habitat for giant pandas that feed almost exclusively on bamboo. How have giant pandas adapted to living in trees? Giant pandas have broad paws with furry undersides and long retractile claws that help them grip when climbing trees. What do giant pandas eat? Giant pandas are omnivores, which means their diet consists of both vegetation and meat. However, bamboo is by far their favourite food. Bamboo is low in nutrients so giant pandas need to eat a lot to survive. 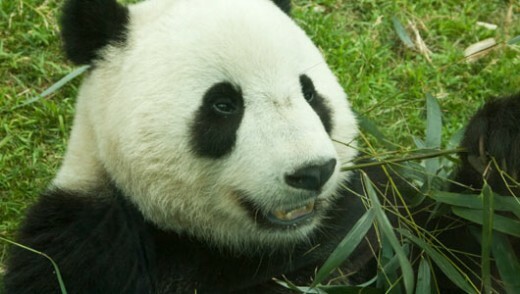 In a single day, they can spend 12 to 16 hours eating, consuming up to 44 lb (20 kg) of bamboo. Shoots, when available, are eaten first as they have the most nutrients, followed by leaves and stems. How have giant pandas adapted to eating bamboo? Giant pandas have an extra digit on their paws that functions like a thumb and helps them to tear bamboo. Strong jaws enable them to crush bamboo up to 1.6 in (4 cm) in diameter, and their molar and pre-molar teeth are adapted to slice and crush tough plant stems. Adaptation doesn’t stop there though, as giant pandas throats have a special lining to protect it from splinters once the bamboo is swallowed. Are giant pandas social animals? Giant pandas are shy animals that prefer to live alone. Using their heightened sense of smell, giant pandas detect the scent of other giant pandas close by and avoid them. The only exception is during the breeding season (March to May) when males use their sense of smell to locate females. How do giant pandas mark their territory? Giant panda tails, which are between 4–6 in (10–15 cm) in length, are the second longest of all species in the bear family. They are fluffy but have a fur free area at the root with scent glands. Scent is excreted from these glands and the brush like tail is used to spread the scent and mark territories. Where do giant pandas sleep? With few natural predators to be afraid of, giant pandas are not picky when it comes to sleeping locations. They will fall on asleep on the forest floor, cosying up next to a tree or balancing on a branch. Much of their time is spent eating, so giant pandas sleep for only 2–4 hours at a time. Unlike other bears, giant pandas do no hibernate during winter months, but instead may migrate short distances to lower elevations. The simple answer as to why pandas don’t hibernate is that they cannot stop eating. The low nutritional value of bamboo prevents them from building fat reserves to last them through the winter. When do giant pandas give birth? Female giant pandas start reproducing when they are 6–7 years old and generally have cubs every two years. They mate in spring (March to May) and give birth five months later in a nest of bamboo. In the wild, it is rare for giant pandas to give birth to twins, but it has been known in captivity. Giant pandas are born blind, and are approximately 1/900th of the size of their mothers. Babies remain with their mothers for 18 months, at which point they are independent enough to establish their own territory. What colour are giant pandas when they are born? Giant pandas are born white and develop their black and white colouring later. What is the biggest threat to giant pandas? With only about 1,000 giant pandas left in the wild, they are considered endangered, and listed as vulnerable on the IUCN Red List of Threatened Species. Giant pandas were once hunted by the Chinese, who believed their pelts provided magical protection against evil spirits, but hunting now carries strict penalties in China, so is less of a conservation issue now. Humans and destruction of habitat now pose the biggest threat to giant pandas. This includes erosion of habitat due to clearing of areas for crop cultivation, and natural die-back of bamboo. The presence of built up areas prevent giant pandas from moving to new areas, so loss of bamboo forests mean many will starve. Do giant pandas have predators? Giant pandas are strong with powerful jaws and teeth so few animals will risk attacking them. However, young giant pandas are more venerable and thus at risk from predators, including jackals, snow leopards, and yellow throated martens. What is being done to help giant pandas? Giant panda conservation is high priority, and consequently many measures have been put in place to help increase the numbers. Scientists around the world are studying their ecology and behaviour and instituting conservation programs. An example is the panda reserve system which was established as part The National Conservation Project for the Giant Panda and its Habitat of 1992. Today there are around 67 reserves. Human interaction within reserves is minimised, and infrastructure is limited as is removal of trees and thus giant panda habitat. The creation of bamboo corridors between built up areas also gives giant pandas more freedom and enables them to move between habitats to find food and mates.